ATI will be officially launching the Radeon HD 4800-series next week some time. However, we've got our hands on an evaluation-unit card from Sapphire, and it would be unfair to keep it under wraps until launch day, right? Whilst we're under a non-disclosure agreement not to disseminate the specifications of the card, we can give you a taste of things to come. We'll have benchmark numbers today, comparing it to a number of cards currently priced between £79 and £149, so head back later for a performance update. Radeon HD 4800-series, code-named RV770, will be composed of two SKUs initially. The Radeon HD 4850 - kind of pre-announced in the form of the workstation-oriented Firestream 9250 - is the budget mid-range part, which will retail for around $199 (£125). Using a single-slot cooler and GDDR3 RAM, it promises to be faster than incumbent HD 3850 and 3870 via, in the main, greater shading and texturing ability. We'll reveal the nitty-gritty next week. Interestingly, NVIDIA's got wind of the pricing and, probably, the performance numbers from ATI's new architecture. We know just how serious the green team is taking the threat by looking at what's happened to GeForce 9800 GTX pricing today. Etailing for around $289 (£170) yesterday, NVIDIA is now recommending an online price of $199 (£125) - some 30 per cent off! What's more, NVIDIA will introduce a higher-clocked version, GeForce 9800 GTX+, at $229, we hear. The faster ATI variant, Radeon HD 4870, will be a faster-clocked version on all counts, particularly with respect to memory bandwidth. Can you guess what speed the RAM is? Retailing at around $299, the card will battle against heavily partner-overclocked GeForce 9800 GTXs and the very cheapest GeForce GTX260. Anyway, enough rambling on the current state of affairs. 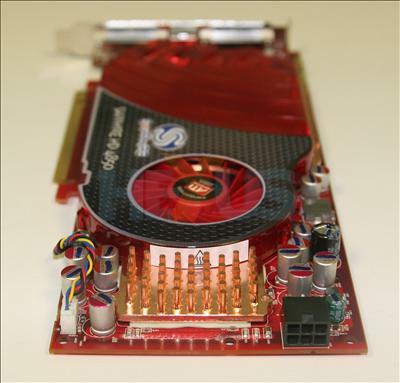 Here's the Radeon HD 4850 512MiB. On first glance the new SKU looks disarmingly similar to the presently-available HD 3850. Here's the single-slot profile. Our testing has shown it to be whisper-quiet in 2D mode, where clock-throttling (PowerPlay) reduces the power requirement substantially. The cooler's barely audible in full-blown 3D mode, which is what we'd expect from a small-ish GPU based on TSMC's half-node 55nm fabrication process. The majority of card will be equipped with 512MiB of on-board memory, run through a revised 256-bit memory bus. The two golden fingers enable CrossFireX - ATI's multi-GPU technology, of course. The six-pin PCIe connector intimates that the Radeon HD 4850 draws a little more power than the HD 3850, which, in reference specification, ships without an auxillary connector. The outputs are what we've come to expect from any modern card. Dual-link DVI supports HDMI passthrough, just like the HD 3000-series. AIBs will be able to leverage on-chip DisplayPort connectivity, but we don't see too many doing that until a greater number of displays are available.